This is a point-of-view review of the 2017 Justice League film for discussion, and assumes some knowledge of the DC Universe characters, settings, and villains. Please see the film before reading this. Spoilers ahead! I’m a big fan of the DC Warner Brothers Animation series of Superman and the Justice League. Justice League Unlimited as well. For me, those are the definitive story lines of that universe. Like a lot of fans, I was disappointed with the Batman vs. Superman film, which was based on such a good story, but included some key storyline changes that didn’t feel like improvements in story or character to me (the ‘Martha’ plot line is what I’m referring to). And, like so many superhero films, the plot was unnecessarily long and complex (couldn’t they, shouldn’t they have left Doomsday for another film?). So, admittedly I didn’t go into Zack Snyder’s Justice League thinking it would become a favorite superhero film. Over all, I wish the makers of these films would have modeled their progression after what Marvel has successfully done with the Avengers films. I feel like too many characters were introduced in this film, so quickly that we don’t learn enough about them. I don’t know how well individual films for Aquaman, The Flash, and Cyborg would have done individually at this point, but their introductions in this film felt rushed and too thin. This film felt very close to the Justice League: War animated feature. It followed the same basic origin story for Cyborg, and it involved extensive battling with Darkseid’s parademons, motherboxes, and other forcs from Apokolips. Maybe both of these stories were just drawn from the same source material, but they were close enough to make me wonder if a direct adaptation of Justice League: War might ultimately have been more successful. My guess is that the filmmakers likely wanted to include Aquaman, I think that he’s seen as a core DC character, right “after” Wonder Woman. If you’re a DC fan and haven’t seen Justice League: War, I highly recommend checking it out, as of this writing it’s available on Amazon Video, iTunes, and DVD. Here are a few thoughts about the Justice League live action film. The film was just so over-stylized, it was hard to relate to as our world, Earth. I understand that we’ve come to expect this from a Zack Snyder film, and I acknowledge that there’s an artistic flavor to it that can be impressive (I thought the metallic-graphite-like technology of the kryptonian world in Man of Steel felt advanced, but in a properly alien way). But here, I think the styling gets in the way of us relating to the characters in the film, it feels like they’re in some dark dream fantasy world instead of ours. Compare this to, say, Marvel’s Captain America: Civil War, where the setting and events feel reasonably real and grounded in our world. I like visual effects as much as the next guy, but so many scenes here seemed so artificial that parts of the film felt more like a video game cinematic than a live-action film. This is not the first time that a story has killed or brought back Superman. But it’s Superman, commonly viewed as the most powerful of beings, and arguably our most important hero. So, if a story does deal with Superman’s death, I expect it to be something special, something out of the ordinary, and I don’t feel like that really happened here. I didn’t like how they just brought Superman back to life, it wasn’t that it was too simple or too complex, it all just felt emotionless and mechanical. There was something so awfully basic about how Superman was killed and reborn in this film and its predecessor. It seemed so meaningless. To be fair, once Clark was awake, the action sequence which pitted the other heros against him was fun, especially the surprise the Flash felt when he realizes he’s up against someone so powerful who can move as fast as he can. I can’t help but compare this to the “Hereafter” episodes of the animated Justice League series, which combined both an interesting story and impressively emotional content for short animated episodes. In “Hereafter”, writer Dwayne McDuffie and Director Butch Lukic masterfully turn what could have been a routine action sequence very quickly into a desperate situation in which Toyman is wielding a weapon of devastating power. Superman sees Bruce and Diana in the line of fire and puts himself between the blast and them without hesitation. And to the horror of the characters as well as the audience, Superman is vaporized. He’s gone. We feel the disbelief on each character’s face as rain falls and smoke clears. Even Snapper Carr is speechless. All is eerily quiet for just a moment until Diana springs to the air, tears in her eyes, in anguish and rage at the same time. In seconds she tears Toyman’s giant robot apart to get to him, and it’s only the Flash and her respect for Superman that stop her. In “Hereafter”, we see and really feel the shock, anger, and despair these characters feel when Superman is gone, and that’s missing in the live action film. 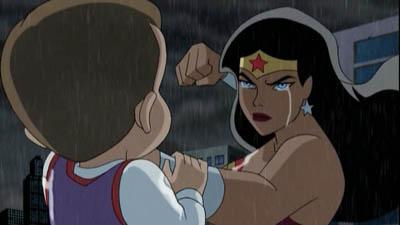 There’s a great article by Daia Gardan outlining this and other emotion-packed moments in the animated Justice League featuring Wonder Woman on MoviePilot.com, definitely check that out! I still can’t accept Ben Affleck as Bruce Wayne. He’s just too famous. We’ve seen him in too many films, too many interviews, magazine covers, paparazzi photos. I’m not saying his performance was terrible or anything, or that he doesn’t acceptably look the part. I just can’t forget that it’s Ben Affleck up there, in these films he never becomes Bruce Wayne for me. And when I can’t suspend my disbelief around such an important character, well, it’s tough for the overall film experience to be great. The visual effects for Steppenwolf weren’t convincing enough to work well as a character. His face just didn’t look real enough. Every other face was a real actor, in comparison Steppenwolf looked like a video game cinematic. Actor Ciaran Hinds is credited with performing only Steppenwolf’s voice; I wonder if motion capture was used to retain some facial performance elements, or if this character was animated using more traditional methods. I also I didn’t like that Steppenwolf kept talking about the “unity”. Usually Darkseid’s crew is just paving the way for his impending invasion. Darkseid just wants to enslave and rule worlds while turning them into another Apokolips, and that’s enough to be afraid of. I don’t know if this was inspired by the “Unity” episode of Superman: The Animated Series (synopsis here), but that’s certainly what I was reminded of, not just because of the word, but of the cultish tone of it all. Regardless, every time I heard talk of the “unity”, it added a weird vibe of cult worship that felt unnecessary and out of place. I was not feeling this version of the Aquaman character in this context. I thought Jason Momoa was a good choice for Aquaman, I’ve really liked his work in other programs. But in this story, Arthur Curry just doesn’t live up to the legend that is supposed to surround him. If you watch “The Enemy Below” episodes of the animated Justice League series (there’s a synopsis on the DC Animated Universe Wiki here), you really see a character who cares deeply for his people and his family, and protects them at great personal cost. The version of the character in this film is powerful, but we just don’t learn enough about him to understand what he cares about and why. I guess this is the version of Arthur Curry from the “Throne of Atlantis” storyline (where, if memory serves, he’s half Atlantean and half human), but either way, the character doesn’t feel as deep as I had hoped (pun intended). I thought Ray Fisher’s performance as Victor Stone, Cyborg, was great. I would like to have seen more of this. Months before this film’s release we saw some footage of the process that Silas Stone went through to save his sone, resulting in Victor becoming Cyborg. We never get to see Victor before the accident. The film does a commendable job of communicating Victor’s strained relationship with his father, as well as Victor’s own horror as he comes to grip with what he has become. But, the same storyline is more richly laid out in Justice League: War, in a way that involves us more in the characters’ relationships with each other, and shows us that Cyborg isn’t just important to this particular story but is a unique and complex character in his own right. It was nice to see at least a quick visual reference to Green Lantern, it really left me wanting more of that in the film. I didn’t really expect to see Hal Jordan or Kyle Rayner or Jon Stewart actually show up. But here’s hoping we get to see Green Lantern come back at some point. If you’re a Green Lantern fan and haven’t seen Green Lantern: First Flight, definitely check that out. If you’re a fan of DC superheroes, I think the Justice League film is entertaining enough to justify the price of a ticket, it’s worth seeing in the theatre. There are enough decent story and action moments to make up for some shallow character development and a couple cringe-worthy pieces of dialogue. For me, though, the Warner animated Justice League series and a few feature-length pieces are much richer and more enjoyable versions of these characters and stories. If you haven’t seen the series, or maybe just haven’t seen it in a while, here are a few ways to catch up.